Warrnambool located on the south-western Coast of Victoria and at the western end of the Great Ocean road, is world famous for it’s spectacular oceanic coastal views. Home club to the Hocken family, Koroit is a humble club amongst farm land with great facilities and very well maintained grounds. 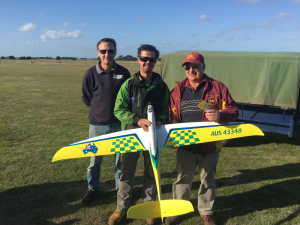 As usual Friday arrivals consisted of pilots and teams travelling from afar and were greeted with perfect Autumn conditions of mid 20′s and light winds. The usual campers of Axons, Steeley’s, Murphy, Arapakis’ settling in for the afternoon and evening grazing with spits roasting and beers flowing. Well into the evening, festivities continued with perfect star filled night skies. In the morning, we woke up to misty rain and cold winds. 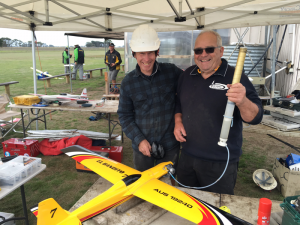 Flying didn’t start until late morning due to the wet weather conditions. The usual race format of F400, Q500 followed by F3D was to be flown. 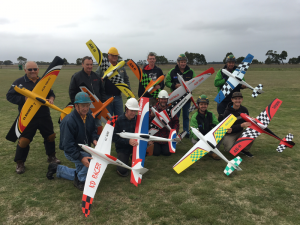 A field of 11 F400 pilots challenged the sky’s with Shaun Jacobsen in fine form with opening rounds in the 60′s putting loads of pressure on the rest of the field. Great to see the South Aussies at the event with 4 pilots flying in this class. Brian (Iron-man) Steele finished with the most cuts for the weekend which is certainly uncharacteristic and Leigh Hocken recording the fastest time of 64.95 seconds. Nevertheless Ranjit Phelan and Baz Murphy finishing 2nd and 3rd respectively after 1st place getter, Shaun Jacobsen. Well done to all pilots. Q500 always slated for a few laughs and a bit of sledging on the start line saw some brilliant flying and sub 100 seconds times by the three top place getters. A mix of experience and newer pilots to the racing scene challenged each other with each pilot flying at their best. Jimmy (Tiger) Orenshaw taking out 1st place again, now in a really good position for the season championship just nudged in front of Tom Allen who came 2nd with Jarrod Jacobsen finishing 3rd dueling Dannmann’s Dad (Andrew Arapakis)for the weekend. F3D with a 10 pilot entry was great to watch. The first up race was with good mates Shaun Jacobsen and Dannmann. Shaun opening up with a personal best, WELL DONE Shauny! Dannmann having looked forward to this weekend, unfortunately hit #2 pilot on his 3rd race with uncharacteristic model issues which saw him finish well down for the weekend. 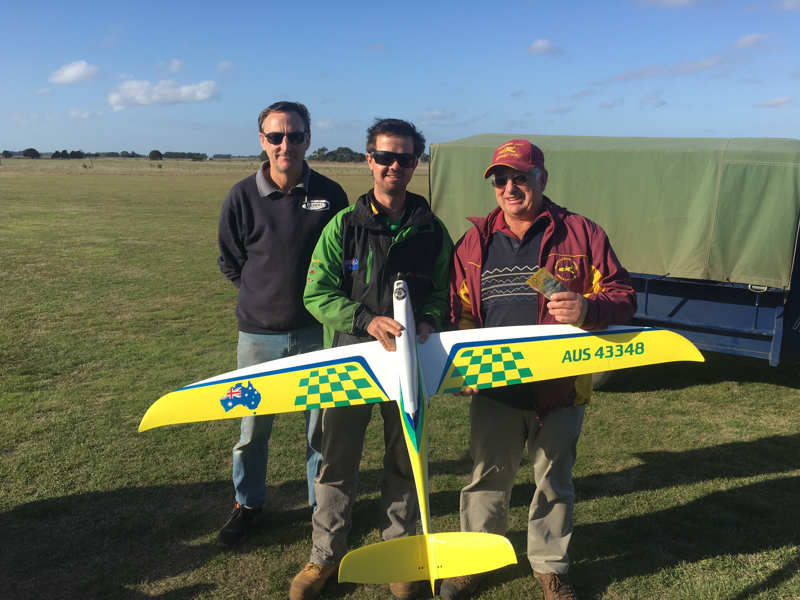 Leigh flew a brilliant race with his average for the event of 60 seconds and Shaun finishing 2nd in his second ever F3D race. He flew very consistently and was closely followed by a veteran of pylon, Baz Murphy, having got all his times in. With only one event to go at Munro before the great race at AMPRA which is being held at Coolum QLD. This will be the first event for the team selection trial for the 2017 F3D World Championships to be held in Sweden. Good luck to all pilots! The following is how the season championship stands currently. No change for the top two positions, but Leigh Hocken has moved up to 3rd position, displacing Glenn Matthews. No change for the top two positions, but Shaun Jacobsen has moved up to 3rd position, displacing Jim Orenshaw. For Q500, again there was no change for the top 3 positions.